If like me you have been a big fan of Annabel Karmel's books since you started to think about weaning - then her new Family Cookbook is really worth a look. 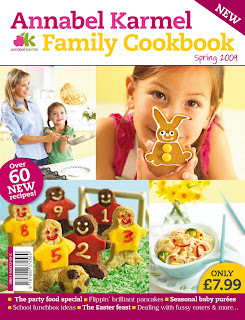 It has some great meal ideas - and not just for kids but for the whole family. There is a fantastic no cook train cake that my kids had a go at making. OK so ours didn't look quite as good as hers did but they had good fun making it. It's in a magazine format and available from supermarkets like Sainsbury's and Tesco and all good newsagents.